Educational facilities always have acoustic problems to solve. Whether it’s multi-purpose rooms, gymnasiums or sports centers, theaters, auditorium’s or music and band rooms, there’s a lot of noise in the educational industry. University of Michigan needed to find harmony in their frequently used band room. With the array of instrutments, varity of noise levels and active students, the sound in their band room has serious reverberation problems. Another major contributing factor in these types of rooms are the construction materials, most often exposed concrete which offers a disadvantage by promoting reverberation, echo and distortion of sound. Mr Wilson of the University of Michigan contacted All Noise Control with the problems they were experiencing in their band room. It was a classic acoustic solution to provide foam to both balance and absorb the sound in the room. We provided the University with the newest pyrmad foam in 2’ x 2’ sheets offering a simple and budget conscious acoustical solution. Harmony was restored in the U. Michigan band room with little impact on often strict educational budgets. The foam panels were also simple to install and handled by the internal maintenance staff quickly and easily. We invite you to call All Noise Control at 561-964-9360 to discuss the noise control materials supplied to this particular facility and are just as happy to listen to your individual needs and supply you with a customized All Noise Control Solution. 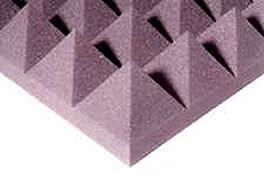 You may also visit our acoustical foams page or our pyramid foams used in this application for more information at www.allnoisecontrol.com. Next Next post: Noise problems from office to office within Syracuse Research Facility….